Following on from the great successes achieved by The Port, The Beast & The Traveller project which took place in 2012 at Newhaven Fort, Zap Art and inroads productions have once again joined forces to develop a second exciting project for 2013-2014, written and conceived by Sara Clifford. Zap Art and inroads are delighted to announce that they have secured £215,000 Grant Funding for a new arts / heritage Project. The project is supported using public funding by the National Lottery through Arts Council England (with a grant of £99900) & the Heritage Lottery Fund (HLF) (with a grant of £99,990), £10,000 from the Big Lottery Fund, Award For All Scheme and a £5000 Arts Partnership Award from Brighton & Hove City Council. Working together with a range of local artists and performers as well as heritage and education organisations, this intergenerational project will explore the social mores and gender etiquette of partner dancing in the 1950’s, and will celebrate the history of the much loved Regent Dancehall in Brighton, (which used to stand where the large Boots store is now), and the beautiful ballrooms at the Winter Garden in Eastbourne. Following the story of a group of friends on a night out just before the Coronation in 1953, the script explores this fascinating time of great change, incorporating live music and dance. From July 2013 through to July 2014 there will be a busy and varied schools and community programme involving younger and older people sharing stories and experiences, learning and working creatively together. There will be a wide range of activities such as talks, exhibitions and tea dances, oral history training, heritage learning & creative art and drama and writing workshops – something for everyone, and all provided free of charge to participants. The project will culminate in two site specific performance events with a script written by Sara Clifford and including art installations, film projections, soundscapes, dance, theatre & music and over 100 community performers. 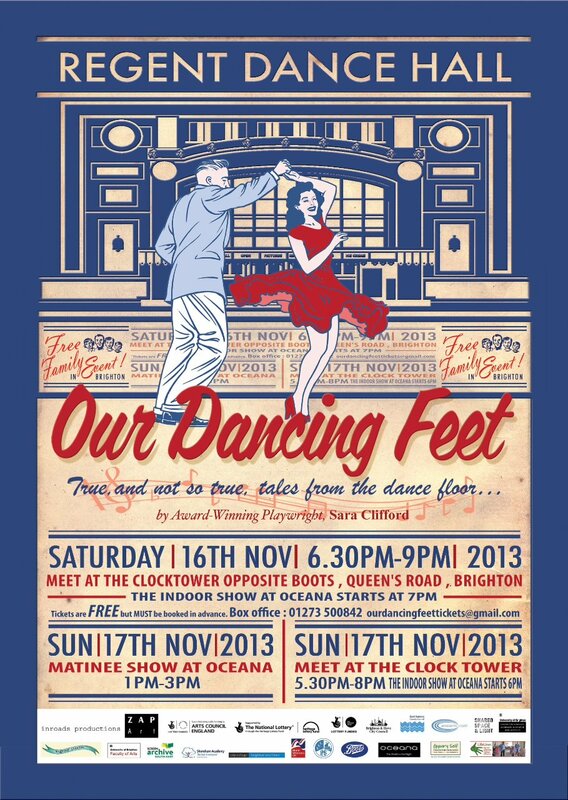 The shows will be presented free of charge to the public on 16th & 17th November 2013 with outdoor projections on the Boots building and an indoor performance at Oceana Night Club in Brighton; and on 22nd & 23rd March 2014 at the Winter Garden in Eastbourne. The HLF-supported workshop programme includes opportunities for training in oral history and interview collection, working with experienced tutors from Brighton University. Stories collected for the project will be incorporated into the script and added to the local oral history archives in both towns. We would like to invite people to share their memories and stories with us – these could be about the Regent Dancehall, going out dancing, music and fashion – or just Brighton and Eastbourne in the 1950’s. If you’ve got a few tales to tell, please get in touch! No single building in Brighton evokes more nostalgia than the Regent Ballroom near the Clock Tower.Many couples met for the first time there, dancing the night away on the beautifully sprung floor. The ballroom was built in 1923 on a site (now occupied by Boots) in North Street next to the Regent Cinema, then the biggest in Brighton. It could house 1,500 dancers – and often did. Top names such as Billy Cotton and Jack Hylton took their bands to Brighton, making guest appearances. The Brighton Herald described the interior decoration as “like an artist’s expression of exclamation. It is jazz in its highest development. To enter without preparation into that great new hall...is to get the effect of a rocket bursting in one’s face. The hall is like an explosion of all the primary and secondary colours, flung hither and thither in a restless, intersecting criss-cross of blazing light”. It was advertised as having ‘the finest sprung dancing floor in the world’ , and you could attend afternoon tea dances, cabaret, balls or take part in dancing competitions. The Regent had expert professional dancing partners for both sexes on hand to show amateurs the steps. For 3/6 for one lesson or 16/- for a series of five you could learn to waltz, tango, fox trot, quickstep and rumba. Keen to get everyone on the floor, their motto was, ‘if you can walk you can dance’. The Regent’s popularity continued into the 1940s and 1950’s as more people than ever chose dancing as a way to escape from the reality of their lives and to have fun. Big bands, swing, jive, jitterbug, the merengue, the samba, the mambo, the rumba, the cha-cha-cha and the bossa nova kept people dancing until the 1960s when changing tastes in music and dance styles brought about the Regent’s decline. The Winter Garden is a Grade II listed building, designed by architect Henry Currey and built in 1875.It consists of two main parts - the Floral Hall, originally used as a skating rink in winter and concert hall in summer, and the Gold Room. One of Eastbourne’s most beautiful concert/theatre venues it hosts weekly tea dances for over 100 elderly people. The venue is managed by ESCC who have agreed to be in kind partners for this project, working with the Local Heritage Centre opposite the Winter Gardens and a number of schools and colleges, and host venue for our performance in Spring 2014.